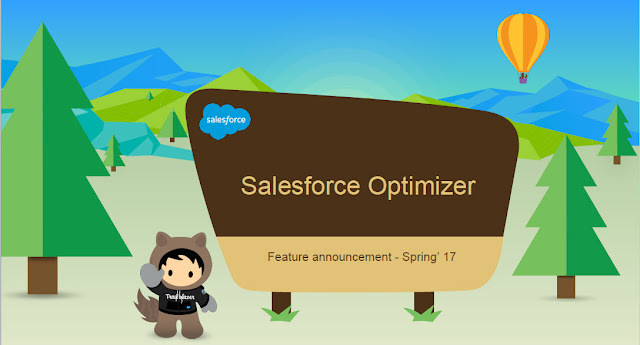 Salesforce introduced the new feature in Spring'17 - Salesforce Optimizer. This is really a nice tool which will evaluate your implementation in terms of the Salesforce features you are using and then identifies the ways to improve the implementation. I know I need to do improvement, but where is the time? Where to start from? I need to convince business in terms of the importance of improvement. I don't want to go to bed every day with the worry that I may be missing something which might break my implementation tomorrow. 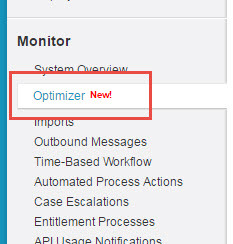 But now with Salesforce Optimizer, I have the answer to all of my doubts, questions. 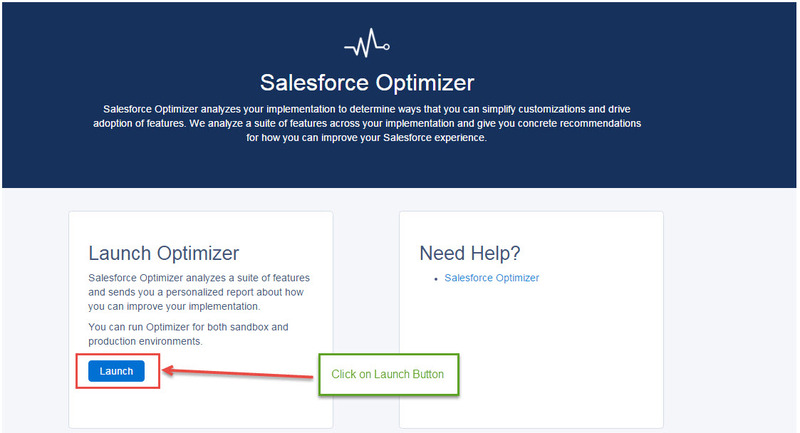 Once you click on the Optimizer, on the next page, you need to Launch Optimizer by clicking on the Launch button. Salesforce will generate the report and send the report to your email address. 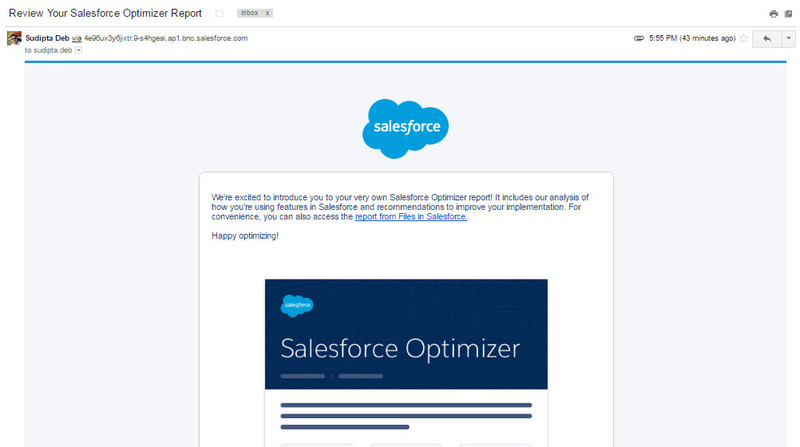 I really love this new initiative from Salesforce, though there are many scopes of improvements in terms of items to be covered in the report. 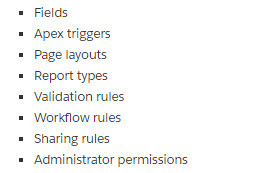 It will be really great to have Apex Class, VisualForce Page, Test Class included in the report. There is a success community where we can provide our feedbacks using #OptimizerReportFeedback. Please let me know if you are using this new feature and what is your comment on this. 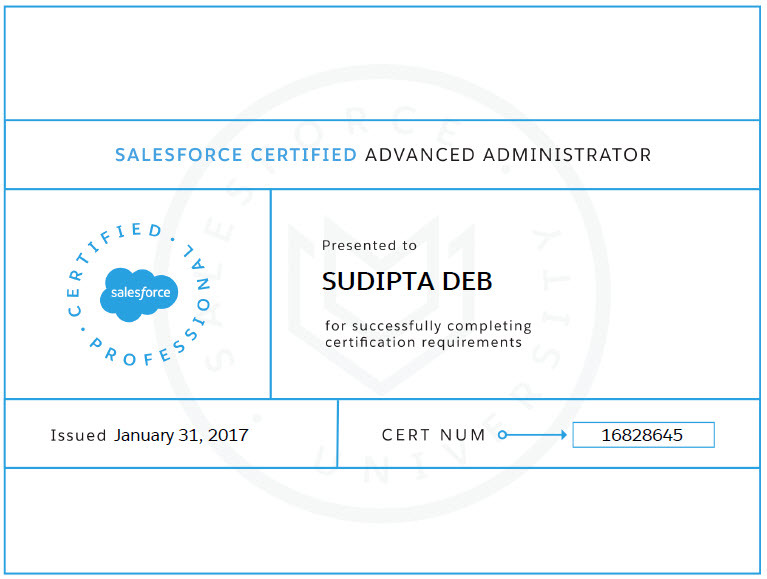 I took Salesforce Advanced Administrator certification exam on 31st Jan'17 and cleared it. In this post, I am going to write down how I approached this certification and my study materials as well. So basically you need to answer ~41 questions correctly. Note - You need to clear Salesforce Certified Administration Certification before this certification. I followed the below strategy by reviewing the certification guide and bucketing the items based on their weightages. This is the formula I followed, topics with more than 10% weightage are my priority items and rest of the items are kind of last minute items to check. These two sections are comparatively very easy and easily you can answer all the questions correctly. The only section which I was not sure and didn't put any effort at all was - Content Management. Note - I got 2-3 questions from this section in the actual exam. I started with Partner Training - Administrator Essentials for Experienced Admin (ADM 211). I will highly recommend you to go through this training if you have access to it. The entire training is very much focused. It is my experience that if you can complete these training, 80% of your preparation is done. This training will not cover the Service Cloud part of the certification. But if you have access to Partner Training, there is another training which you should consider as well - Service Cloud for Admin. Forecasting (Collaborative and Customizable Forecast): You will get some 4-5 questions regarding this concept. I started with the Youtube video here. Apart from this one, I watched the Youtube series - Use what you pay for. This video will tell you the differenced between Collaborative and Customizable Forecast. You will 100% get questions regarding this. Territory: Watch the youtube video here. Also, read the Salesforce documentation - Territory Management. Reports and Dashboards: I just studied the trailhead section here. For Dynamic Dashboard, watch the Youtube video here. For Cross Filters and Joined Report, watch the Youtube video here. You need to read Analytical Snapshot, PARENTGROUPVAL and PREVGROUPVAL. Security: This is a huge topic. I started with Trailhead module on Data Security. Watched Shell Black's Whiteboard Series. Read Permission Set Consideration, Control Who Sees What, Delegate Admin. Product and Price Books: Read my previous blog posts - Products and Price Books in Salesforce, Relationship between Product, Price Book and PricebookEntry, Product Schedule in Salesforce. You need to understand how cloning of Product works in Salesforce as well. Quotes: I read the blog post - Salesforce Quotes Part I - Overview and Key Fields, Salesforce Quotes Part II - template Design and Limitations. Change Management: I read the Trailhead module - Change Management. Data Management: Again Trailhead module - Data Management. Data Modeling: Trailhed module - Data Modeling. Process Automation: You will get many questions from this section. So make yourself comfortable with the concept. Read my blog post - Choose Correct Process Automation Tool, Choose between Apex Trigger and Lightning Process Builder. You can read the Trailhead module as well - Process Automation. User Management: Trailhead module - User Management. I have mentioned all my study materials at the top. Apart from studying individual concepts, I tried to practice the same in my developer org. Practicing the items in your developer org will help you to understand the concept. Remember - Salesforce Advanced Administrator Certification is all about how much you are comfortable with concepts and have you done implementation before on those concepts? So practicing in your developer org will give you that extra edge for sure. Finally, I have completed few Mock Exams to understand my readiness. Again, don't trust any of the Mock Exam. Use them to understand which section of the exam you need to put more effort. Repeat this same step multiple times until and unless you get the answer - YES for the question - AM I READY FOR THE EXAM? I wish you all best of luck for the exam! Feel free to add your comments and add resources which helped you.